Add some colour and quirkiness to your event with our multipurpose LED spheres, perfect to place both outdoors and indoors. The illuminated LED spheres are typically used outside the venue to add some colour to the grounds, or to brighten up a path. 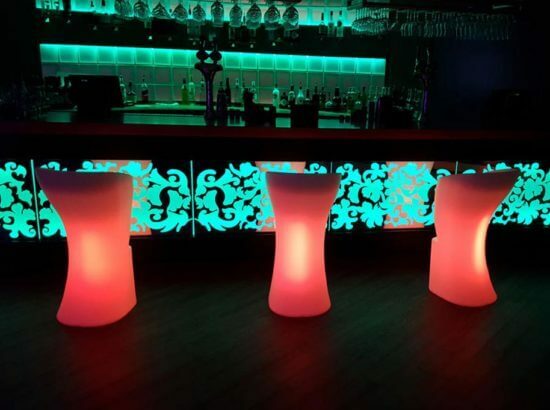 They can also be placed on top of a table at an evening reception to emit a warm coloured glow – and with multiple spheres inside one hall, you can create a wonderful multi-coloured environment. The LED spheres are battery operated and are controlled by an easy to use handheld controller, making them simple and straightforward to use. They are also manufactured using a robust polyethylene material which allows them to be firm whilst letting light emanate from the base of the unit. In addition, the LED spheres are IP65 rated, making them waterproof and suitable for outdoor use even in the rain. We will deliver, install and set the LED spheres to a colour of your choice, but you could always set them to fade through different colours if you wish, and if you fancy a change throughout the night, simply point the controller at them and choose the colour that you like. There is no right or wrong quantity of LED spheres – it all depends on your personal preference, how you plan to use them, and the available room. We have created an LED Sphere Package which is perfect to book if you planned to use the spheres outdoors at your event and have plenty of space to do so. To find out more about our LED spheres, or to book some for your event, get in touch with our friendly team. We look forward to hearing from you.